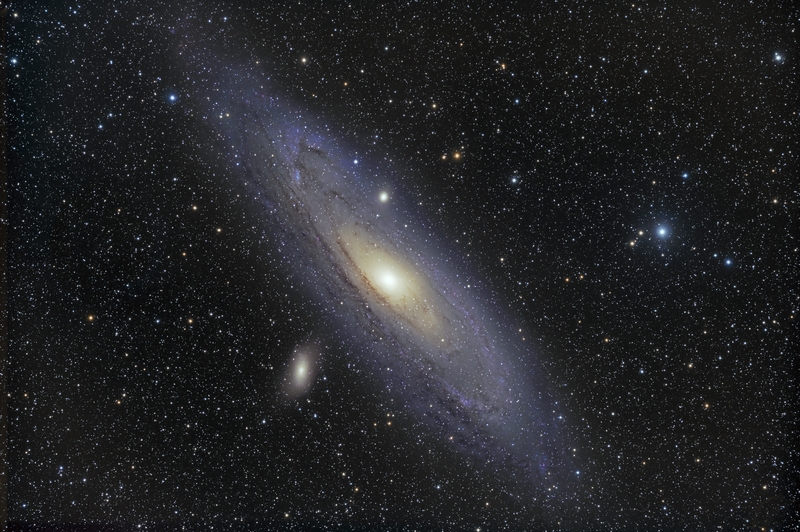 Messier 31 (M31 NGC 224) also known as the Andromeda Galaxy, is a magnitude 4.4 spiral galaxy in the constellation of Andromeda. It is the nearest spiral galaxy to our own, at a distance of 2.54 million light years. It is a naked eye object at dark sites, and has a very large apparent size of 190 x 60 arc minutes, or 3 degrees by 1 degree. The faint areas stretch to 7 times the diameter of the full moon. This is a large, popular photographic target, and this is my third try. I tried to capture more faint detail and better color this time in this 12.7 hour image.